A cynic would be forgiven for wondering whether the press conference Minneapolis mayoral candidate Mark Andrew held Monday afternoon, flanked by five members of the school board, was at least partly an exercise in damage control. At the session, held in the library at Windom Dual Immersion School in southwest Minneapolis, Andrew announced a three-pronged education agenda. At its center: a promise to convene a collaborative headed by education advocates with divergent philosophies, Mike Ciresi and Louise Sundin. Minneapolis plans to spend $524,944,868 (PDF budget book) during the 2013-2014 school year for 34,148 students or 15,364 per student, about the same as Madison. When Madison public school students go back to class Tuesday, they’ll find﻿ some lessons will be tougher, according to Superintendent Jennifer Cheatham. The gradual implementation of the Common Core standards, a series of benchmarks for what students should know and be able to do, will begin this year by helping educators, students and staff understand what the standards are and how ﻿instruction will change ﻿. Teachers will implement Close Reading, a﻿ practice used ﻿to study literacy standards ﻿, to become more familiar with the increase in rigor and standards while monitoring how the students and the teachers themselves are faring ﻿. “The study will allow teachers to better understand the standards ﻿and learn about what it will take to plan instruction using the standards and learn more about instructional practices necessary to teach the standards and learn about” ways to assess what students are learning, ﻿Cheatham said. An example of a Close Reading lesson would be reading a primary source document in a history class and later answering short-answer questions. Teachers would ﻿review how students performed, what challenges there were and what the teacher could do to improve. Graphical user interface? I think not, Mr. Jobs. Mainframe is where it’s at. Big and honking, run by guys in white lab coats. Smart phones? iPads? You’re dreaming. Take your new ideas somewhere else. That is the Madison School Board. It has decided to batten the hatches against change. It is securing the perimeter against new thinking. It is the North Korea of education: insular, blighted, and paranoid. 1) Preserving the status quo: Any proposed charter school would have to have “a history of successful practice.” That leaves out several existing Madison public schools – never mind new approaches. 2) Starvation: Cap per-pupil reimbursement at around $6,500 – less than half what Madison public schools consume. 3) Encrustation: Unionized teachers only need apply. I spoke to Carrie Bonk, executive director of the Wisconsin Charter Schools Association. The rejected Studio charter school. Minneapolis teacher’s union approved to authorize charter schools. “We are not interested in the development of new charter schools”. Notes and links on the rejected Madison Preparatory Academy IB Charter School. Madison School District Open Enrollment Leavers Report, 2012-13. Madison’s disastrous long term reading results..
Interview: Henry Tyson, Superintendent of Milwaukee’s St. Marcus Elementary School. It is the policy of the School Board to consider the establishment of charter schools that support the DISTRICT Mission and Belief Statements and as provided by law. The BOARD believes that the creation of charter schools can enhance the educational opportunities for Madison Metropolitan School District students by providing innovative and distinctive educational programs and by giving parents/students more educational options within the DISTRICT. Only charter schools that are an instrumentality of the DISTRICT will be considered by the BOARD. 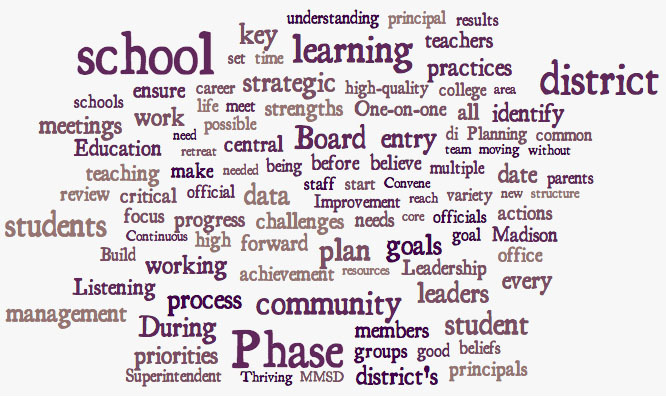 Incoming Madison Superintendent Jennifer Cheatham (1.4MB PDF):. Much more on Jennifer Cheatham, here along with a history of Madison Superintendents. TJ Mertz, an Edgewood College history instructor and education blogger, is running unopposed after Sarah Manski dropped out of the race for Seat 5 following the February primary. Her name will appear on the ballot, but she is moving to California. Mertz will replace retiring school board member Maya Cole. In this competitive series of elections, there are numerous candidate forums and listening sessions under way, and we thought we’d pose our own questions to candidates. This week, we ask the candidates about where they think incoming superintendent Jennifer Cheatham should direct her attention. We also ask about the changes in collective bargaining wrought by Act 10: How have they affected the district, and how should it respond to this new policy? The secrecy that attended the Madison School District’s pick of a new superintendent was bad form and bad public policy. Prior to making its selection, the district announced just two finalists, one of whom was found to have a closet full of skeletons that prompted his withdrawal. The remaining finalist, Jennifer Cheatham, got the job. State law requires that at least the top five contenders for such a position be named, but does not specify when. The Madison School District decided to do so after it was too late to matter. And then, to add insult to injury, the district’s lawyer, Dylan Pauly, dissed the disclosure law that the district complied with only belatedly. “We believe that by releasing these names, pursuant to our legal obligation, we are negatively contributing to the chilling effect that is occurring across the state with respect to school boards’ abilities to recruit and hire highly qualified individuals as superintendents,” she wrote. Wisconsin law requires boards to release the identities of at least five candidates to the public upon request when there are at least five applicants, according to a 2004 opinion by then-Attorney General Peg Lautenschlager. The opinion doesn’t specify when the names must be disclosed. School district officials said Friday they were still reviewing the newspaper’s request. On Tuesday district lawyer Dylan Pauly told the newspaper the district would respond to the request within 10 business days. Bill Lueders, president of the Wisconsin Freedom of Information Council, said the School Board “is clearly violating the spirit of the law” by not making the names public before the board made a decision. The law calls for records to be provided as soon as possible. “For the district to pick a superintendent candidate without first meeting its statutory obligation to identify (at least) five candidates considered most qualified delegitimizes the selection that is made,” Lueders said. It’s also illegal. Government entities cannot require a requester to come into the office to get a copy of a record except in the rare circumstance where it is not possible to copy the record. Wisconsin law provides plainly that “any requester has a right to inspect a record and to make or receive a copyof a record that permits photocopying.” Wis. Stat. 19.35(1)(b) (emphasis added). Decades ago, the law actually permitted the government to choose whether to provide a copy or require the requester to come in and copy it. In 1991, however, the legislature amended the law to remove that choice when a request is not made in person. State ex rel. Borzych v. Paluszcyk, 201 Wis. 2d 523, 527, 549 N.W.2d 25 (Ct. App. 1996) (describing the legislative history and noting that “[b]y statute, [the custodian] was required to photocopy and send the material requested”). Be aware, though, that the government entity can charge you the actual postage cost to mail the copies. Wis. Stat. 19.35(3)(d). When the Education Action Group ran into this kind of excuse from a school district* in northern Wisconsin last week, they called us. We wrote a letter to the school district’s superintendent, and the very next day EAG got an email saying the records were in the mail. Know your rights when it comes to open records! If you ever want some advice about how to file a record request, what to ask for, or whether the fees being charged are lawful, give us a call. The Urban League of Greater Madison strongly supports the Madison School Board’s decision to hire Dr. Jennifer Cheatham to serve as the next Superintendent of Schools of the Madison Metropolitan School District. Dr. Cheatham’s strong background in teacher quality, teacher evaluation, instructional leadership and organizing school system functions and operations around the educational and developmental needs of young people will be great assets for Madison’s public schools. The Urban League is presently partnering with the Madison Metropolitan School District on the recruitment of high quality teachers and professional staff, preparing high school juniors and seniors for the ACT college entrance exam, and engaging parents of color in the work and decision-making of the school system. The Urban League also launched the Urban League Scholars Academy in January 2013 at Sennett and Toki Middle Schools, a program that extends the instructional day for 6th graders by 80 minutes in reading/language arts and mathematics. The League also operates the Schools of Hope tutoring program at 17 middle and high schools in Madison, Middleton, Oregon and Sun Prairie in partnership with these school districts, the United Way of Dane County and Madison School Community Recreation. After paying an Iowa-based headhunting firm $30,975 to develop a candidate profile and launch a three-month nationwide recruitment effort, and after screening 65 applications, the Madison school board has narrowed its superintendent search down to two finalists. Dr. Jenifer Cheatham is chief of instruction for Chicago Public Schools, and Dr. Walter Milton, Jr., is superintendent of Springfield Public Schools in Illinois. Parents and community members will get a chance to meet both finalists at a forum at Monona Terrace starting at 5:45 p.m. Thursday night. But despite the exhaustive and expensive search, the finalists aren’t without flaws. Cheatham was appointed to her current post as chief of instruction in June of 2011 by Chicago Public Schools CEO Jean-Claude Brizard, who has since resigned. According to her Chicago district bio, Cheatham’s focus is improving urban school districts by “developing instructional alignment and coherence at every level of a school system aimed at achieving breakthrough results in student learning.” Cheatham received a master’s and doctorate in education from Harvard and began her career as an 8th grade English teacher. But she found herself in a harsh spotlight as Chicago Mayor Rahm Emanuel and district officials pushed for a contentious 7.5 hour school day last year, which became one of many big issues that led to the Chicago teachers strike in September. “It was handled horribly in terms of how it was rolled out,” says Chicago attorney Matt Farmer, who also blogs about Chicago school issues for The Huffington Post. Farmer says pressure was mounting last spring for the district to explain how the longer day would work and how it would be paid for. Cheatham was sent to a community meeting he attended on the city’s south side to explain the district’s position. Madison School Board president James Howard said Monday he wasn’t aware of some of the controversial aspects of Walter Milton Jr.’s history until after the board named him a finalist to be Madison’s next superintendent. A Springfield School District spokesman said Milton is declining interviews until a community forum in Madison on Thursday. Prior to Fallsburg, Milton was a teacher and principal in his hometown of Rochester, N.Y. He received a bachelor’s degree in African history and African-American studies from Albany State University, a master’s degree in education from the State University of New York College at Brockport and a Ph.D. in education from the University of Buffalo. Milton’s contract in Springfield expires at the end of the 2013-14 school year. His current salary is $220,000 plus about $71,000 in benefits. Madison School Board member Marj Passman says she was looking for superintendent candidates who have had experience working in contentious communities. “That’s important, considering what we’ve gone through here,” she told me Monday. And what Madison schools are going through now. The Madison Metropolitan School District had scarcely released the names of the two finalist candidates — Jennifer Cheatham, a top administrator in the Chicago Public School System and Walter Milton Jr., superintendent of the schools in Springfield, Ill. — before the online background checks began and comments questioning the competency of the candidates were posted. So the new Madison superintendent has to be someone who can stand up to public scrutiny, Passman reasoned. And the issues that provoked the combative debate of the last couple of years — a race-based achievement gap and charter school proposal meant to address it that proved so divisive that former Superintendent Dan Nerad left the district — remain unresolved. So, Passman figured, any new superintendent would need experience working with diverse student populations. Both Cheatham and Milton fit that bill, Passman says. What are the odds that the traditional governance approach will substantively address Madison’s number one, long term challenge? Reading…. Much more on the latest Madison Superintendent search, here along with a history of Madison Superintendent experiences, here. The Madison Metropolitan School District has chosen the two finalists for the superintendent position, it was announced Sunday in a press release. The two finalists are Dr. Jennifer Cheatham, chief of instruction at Chicago Public Schools, and Dr. Walter Milton, Jr., superintendent of Springfield (Ill.) Public Schools. The public is invited to a public forum Thursday, Feb. 7 at 5:45 p.m. at the Monona Terrace to meet and ask questions of the two candidates. If you cannot attend the forum, you can email your comments or questions to board@madison.k12.wi.us. Much more on Madison Superintendents. A recent look at Madison Superintendent hires. She has worked as a Chief Area Officer for Chicago Public Schools and the executive director of Curriculum and Instruction for San Diego City Schools, the biography said. She has a bachelor’s degree in English from DePaul University, a master’s in education from the University of Michigan, and a master’s and doctorate in education from Harvard University. According to a personal website promoting his book, “Me in the Making: One Man’s Journey to Becoming a School Superintendent,” Milton is a native of Rochester, N.Y., who earned a bachelor’s degree from the University of Albany and a master’s from SUNY College at Brockport. He took post-graduate courses at the University of Rochester to receive his administrative certifications, including his superintendent’s license. He holds a doctorate of education in leadership and policy from the University of Buffalo. He has also been a teacher and principal. Google News on On Chicago & Dr. Jennifer Cheatham. More, here:Long on Class Time, Short on Answers . Google News on Springfield Superintendent Walter Milton. The Building Our Future plan provides direction for improving student achievement and district accountability. The plan identifies specific strategies and corresponding measures to meet the four overarching priorities of the district. The measures provide data to monitor progress towards improvement. The key reason to include district and program measures in this report is to make sure that the Building Our Future plan is contributing to closing achievement gaps. Each program and initiative in Building Our Future is based on extensive research and planning. However, it is important to connect these initiatives to tangible outcomes. Tracking these measures helps increase accountability, allocate resources effectively and efficiently, and continuously improve our efforts to educate all students. When our teachers apply strong, explicit teaching skills within an aligned multi-tiered system of instruction and support, and students attend school regularly with behavior that positively impacts their learning and the learning environment, then students will show academic achievement, and social and emotional growth and gaps in learning and achievement will close. This report outlines 2011-12 progress indicators for each of these priorities and includes historical data when appropriate. Strategies: Each initiative in Building Our Future is outlined in the report, including a narrative description, the alignment to district priorities, the primary contact(s), action steps, and objectives with annual progress measures. When available, data from 2011- 12 on key progress indicators is included, along with relevant history for comparison. The approved 2012-13 budget for each strategy will also be integrated into the report to help contextualize how MMSD will allocate resources for this initiative moving forward. Goal setting: This update includes a discussion on the methods used to set goals associated with each strategy. These are described in Attachment 3 and use literacy goals for Chapter 1, Strategy #1 as an example. T: The assumption in the discussion of parent engagement and academic achievement is that it is African-American parents who are not engaged. JH: I think that’s the reality of it. The question is: why aren’t they engaged? The latest survey we had showed that roughly 40 percent of African-American high school students were not engaged. Why? What happens to the kids? We seem to lose them over time, and we lose the parents. CT: That’s a pernicious thing for black youth, isn’t it? Why do you think it’s happening? JH: I think one of the things is that we need to create a culture in our schools that these kids can feel they are more a part of. For example, we don’t present “American” history — there’s a lot of African-American history that never makes it to the books. So, if we as a country, as a community, would depict the true picture and make them part of it, I think kids would remain engaged longer. Related: An interview the Henry Tyson, Superintendent of Milwaukee’s St. Marcus school. Gary Solomon was elevated to CEO of PROACT Search in 2009. Previously, Mr. Solomon had founded Synesi Associates and worked in Education for the past twenty years, starting as a high school teacher and administrator in the Chicago suburbs. Gary transitioned from the public to the private sector taking on a position as Vice President of Sales and Marketing for The Princeton Review, and was responsible for rebuilding the sales organization into a senior consultative team focused on creating custom solutions in the areas of assessment, professional development and academic intervention. During his six years with The Princeton Review, where annual revenue goals were exceeded by and average 150%, Solomon was fortunate to do significant business in many of the top 50 urban districts in the country, and work with some of the best and brightest reformers in the K12 space. A graduate of the University of Illinois, Solomon holds a Masters in Education Arts from Northeastern University. Thomas brings an extensive background in educational management in the private sector, as well as numerous start-ups across various industries. He recently served as Vice President at one of the largest publicly traded test preparation companies where he was directly responsible for their sales teams as well as online learning division. Previously Thomas built an urban tutoring program in Chicago to service over 8,000 students with recognition for a quality program from the local and national government. Thomas has also started-up a Wireless Internet company, a Sales and Marketing company as well as a boutique Venture Capital firm. Thomas has been published by the Northwestern Press for his work in political economics and is and active volunteer at many organizations including Habitat for Humanity, Northwestern University and Steppenwolf Theatre. He’s been a guest lecturer at Northwestern University, where he earned his B.A. in Economics and Slavic Languages. Phil Hansen is a seasoned educator with an impeccable record rooted in Accountability. For fifteen years Phil taught history, before moving on to five years as assistant principal for the Chicago Public Schools (CPS), and then Director of Special Education in the southern suburbs of Chicago. In 1991 Phil took on the role of Principal at Clissold Elementary, a Chicago Public school. In 1995 he became the CPS Director of School Intervention, before moving on in 1997 to take on the position of Chief Accountability Officer, where he served until 2002. At this time Phil was offered a position working as an assistant to the Illinois State Superintendent where he was the liaison between CPS and the Illinois State Board of Education specifically focused on No Child Left Behind (NCLB) implementation throughout the state. As an active member of his community, Phil has also served as President and Secretary of the Beverly Area Planning Association, and has received rewards for service from both the local community as well as the greater city of Chicago. Most recently Phil was honored as an outstanding City of Chicago Employee and Outstanding Educator from the National Conference for Community and Justice. Steve Kupfer serves as Northeast Regional President for PROACT Search and is responsible for executing talent management and support strategies in K-12 education institutions and organizations. He was previously a Senior Consultant in the education practice at Public Consulting Group where he worked alongside district leadership to implement web-based special education and response to intervention (RtI) case management modules in some of the largest school districts in the country, including Miami Dade County Public Schools, The School District of Philadelphia, and the Louisiana Recovery School District. Steve brings practical, district-level experience in organizational development to challenges in K-12 human capital management and support. In his most recent role, he leveraged local leadership to build operational and financial capacity through Medicaid reimbursement programs, mitigating budget shortfalls and sustaining critical student services. Steve has also developed and implemented comprehensive strategies to engage and communicate with key internal and external stakeholders across districts, and has front line experience with the urgency and complexity of the problems school leaders face today. Steve is a proud product of the K-12 public school system. He went on to receive a B.A. in political economy from Skidmore College, where he played baseball and was a member of various chamber music groups. He continued on to receive an M.B.A. from Clark University. Krissi Osborn runs all Operations and Recruitment for PROACT Search. In her role with the company, she has additionally established an award winning internship program exclusively with Northwestern University. Krissi is an active member in her Chicago community, volunteering as an ESL Tutor in Albany Park, as well as on the executive board for a community outreach group. Krissi graduated from Northwestern with a Bachelor’s degree in Psychology and History from the Weinberg College of Arts and Sciences. Notes, links, audio and video from the 2008 Madison Superintendent Search: Steve Gallon, James McIntyre and Dan Nerad. Notes and links on Madison Superintendent hires since 1992. A few links on Madison’s interim Superintendent, Jane Belmore. Belmore was Madison’s Assistant Superintendent for Elementary Schools before moving to the School of Education at nearby Edgewood College. And, of course, there are quite a few schoolinfosystem.org links, including this post on the District’s reading problems. Reading, which is clearly the District’s job number one, continues to be a challenge, according to this 2009 Reading Recovery study: 60% to 42%: Madison School District’s Reading Recovery Effectiveness Lags “National Average”: Administration seeks to continue its use. Finally, a bit of history on Madison Superintendent hires over the years. Dan Simmons article mentioned the School District’s spokeswoman: Rachel Strauch-Nelson. Interestingly, Ms. Strauch-Nelson formerly worked for Madison’s previous Mayor, Dave Cieslewicz and prior to that for the Democratic Party of Wisconsin. Chief Information Officer Andrew Statz also worked for the previous Mayor. The Madison School Board is moving quickly to conduct a search for a new superintendent to replace Dan Nerad. The board plans to vote Monday on hiring a consultant for up to $3,000 to assist with the search process. A board committee Friday recommended hiring George McShan, a former president of the National School Boards Association from Harlingen, Texas. McShan advised the board in 2007-08 when it hired Nerad. The committee also recommended hiring a search firm by the end of July to help find the best candidate. Separately, the board is considering candidates to hire on an interim basis should Nerad leave sooner than expected and the search for a permanent replacement is still ongoing. A bit of history and perspective on recent Madison Superintendent hires. 6. Superintendent Search- Leadership Profile Development Session Schedule, which reflects how community engagement was handled during the previous search. Dave Zweiful shares his thoughts on Dan Nerad’s retirement. The Day After: What’s Next for Madison’s Public Schools? With one of the most competitive and expensive school board races in the history of the Madison Metropolitan School District now behind us, it is time for us to get to work on strengthening public education in our capital city and ensuring that every single one of our children have the schools and tools they need to succeed in education and in life. We congratulate Mary Burke and Arlene Silveira for their success in securing three-year terms on the Madison Board of Education. They will bring significant experience and business acumen to the School Board. We also give great respect to their challengers, Nichelle Nichols and Michael Flores, for stepping up, taking a stand for children and ensuring that the voices of parents and children of color were front and center during the campaign. They ensured that the discussion remained focused on the alarming racial achievement gap that exists in our schools, and we deeply appreciate them for it. As the Board of Education moves forward, we expect they will remain focused on our community’s five greatest priorities: (1) eliminating the racial achievement gap; (2) establishing world class schools that attract enrollment and prepare all children to thrive and succeed in college and work after high school; (3) empowering parents and engaging them in their children’s education; (4) developing a highly talented and skilled workforce that is more reflective of the students our school district now educates; and (5) aligning the District’s employee handbook to the priorities, needs and goals of students, staff and schools. The Board of Education can start by focusing their efforts on hiring an outstanding new Superintendent who possesses significant leadership skill/experience and business acumen, a proven track-record of successfully leading urban schools with significantly diverse student populations; and a strong, clear and compelling vision and plan for public education and our children’s future. Partnering with the United Way, Urban League, Boys & Girls Club, Centro Hispano, Hmong Education Council and other agencies to effectively build awareness and educate the community about local and national best practices for eliminating the achievement gap and preparing all youth for college and work. We look forward to working with YOU, the Board of Education, our community partners and the leadership of our public schools to implement immediate opportunities and solutions that will benefit our children TODAY. Thanks to the four citizens who ran. The Silveira/Nichols race was interesting in that it was the first competitive school board election involving an incumbent in some time. 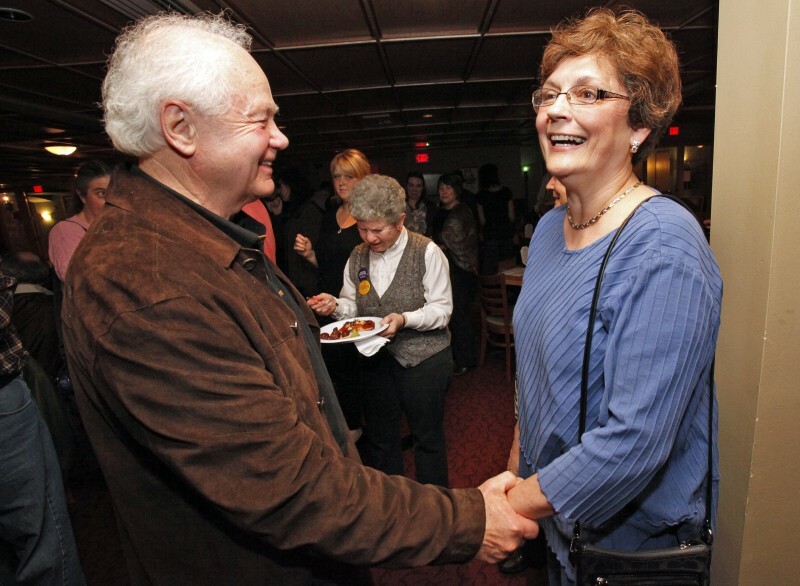 Lawrie Kobza and Lucy Mathiak defeated incumbent candidates during the mid-2000’s. Perhaps the “success recipe” requires that the insurgent candidate have a strong local network, substantive issues and the ability to get the word out, effectively. Arlene is a different incumbent than those defeated by Kobza & Mathiak. That said, she has been on the board for six years, a time during which little, if any progress was made on the MMSD’s core mission: reading, writing, math and science, while spending more per student than most Districts. Perhaps the Superintendent’s looming departure offers an opportunity to address the core curricular issues. I wish the new board well and congratulate Mary and Arlene on their victories. Paraphrasing a friend, it is never too early to run for the School Board. Three seats are up in 2013, those currently occupied by Maya Cole, James Howard and Beth Moss. The Madison Metropolitan School District’s Board of Education vote on the proposed charter school, Madison Preparatory Academy, is just around the corner. We have heard from school board members, business leaders, teachers and other members of the community. It’s safe to say that this is one of the most important issues in this city’s history. While I am happy that Madison is finally having the long overdue conversation about how we educate our students who are falling through the cracks, I am not happy that the Urban League of Greater Madison and the school district couldn’t come together to agree on a solution. In fact, it bothers me greatly. It is a huge mistake to have this yearlong discussion come down to a contentious school board vote on Dec. 19. Both sides needed to come together to figure out a way to make Madison Prep a reality before that meeting. Madison Metropolitan School District Superintendent Dan Nerad and various members of the school board say approving Madison Prep would violate the current contract with Madison Teachers, Inc. So, if 2012 isn’t feasible, committing to a date to open Madison Prep’s doors in 2013, and using the next three to six months to figure out the terms of that agreement should have been an option. But, unfortunately, that’s not going to happen. Instead we have a school district and a civil rights organization arguing over ways to address the achievement gap and graduation rates. Not a good look. And the future relationship between the MMSD and the African American community could hang in the balance. 2011-2012 Revised Budget 1.3MB PDF (Budget amendments document). District spending remains largely flat at $369,394,753, yet “Fund Equity“, or the District’s reserves, has increased to $48,324,862 from $22,769,831 in 2007 (page 24). The District’s property tax “underlevy” (increases allowed under Wisconsin school revenue limits which are based on student population changes, successful referendums along with carve-outs such as Fund 80, among others) will be $13,084,310. It also appears that property taxes will be flat (page 19) after a significant 9% increase last year. Interestingly, MSCR spending is up 7.97% (page 28). I welcome clarifications and updates to these numbers, which are interesting. We’ve seen a doubling of District reserves over the past few years while spending has remained relatively flat as has enrollment. Finally, this is worth reading in light of the District’s 2011-2012 numbers: Madison Superintendent Dan Nerad Advocates Additional Federal Tax Dollar Spending & Borrowing via President Obama’s Proposed Jobs Bill. First of all, our thanks and compliments to you and the administration for undertaking the assessment of literacy in the District. Thanks also to staff and outside advisors for their contributions to making the Report and Recommendations the most meaningful and significant direction for systemic change toward achieving measurable results in student achievement and staff performance in the District’s recent history. We urge the Board of Education support of the Literacy Report AND adoption of the recommendations for implementation of the initiatives and for the budget proposed in the Superintendent’s Preliminary Budget for 2011-12. It is vital for the Board to support the direction of the initiatives for balanced literacy with integrity at all grades levels of the District. It is deplorable that heretofore there has been no systematic plan to address the reading and writing shortcomings of the District that are the most fundamental causative factor contributing to the “achievement gap”. Finally, we have pro-active leadership from Dr. Sue Abplanalp, who has a full grasp of the organizational development and change processes critical and significant to the implementation and sustainability of difference- making strategies. The proposed design of systemic changes to the curriculum, instructional strategies, engagement of teachers, support staff, students and parents/other adults and the realignment of financial and other resources will result in measurable student growth. Board adoption of the $650,000.00 2011-12 budget considerations is an absolute necessity of the very highest priority. We urge you to get on with it. Thank you. Austin schools Superintendent Meria Carstarphen met with facilities task force members Saturday to encourage them to broaden their scope and not to focus as much on the district’s looming budget crisis. In recent weeks, the task force seemed to stray a bit from its mission of creating a 10-year plan on future schools, renovations and attendance zones. After it earlier this month named nine schools that could be closed for efficiency’s sake, outraged community members rallied to save their schools. Although the long-term plan probably will have recommendations on closures, task force members said they felt pressured to produce short-term fixes to help the district get past one of the worst anticipated budget shortfalls in its history. On Saturday, Carstarphen, in effect, told task force volunteers that was her burden, not theirs. The Austin School District’s 2010-2011 budget is $973,997,900 for 86,000 students ($11,325.55 per student). Madison’s 2010-2011 budget is $379,058,945 (according to the January, 2011 “State of the District” presentation for 24,471 students. That is $15,490 per student. and end goals have not changed, but how we articulate this work has become more explicit, transparent and responsive. Weare in process ofcreating a more comprehensive plan to be shared with a broad range ofaudiences. We will share that plan with the Board of Education when finalized. We will also share periodic updates with the Board of Education. ill the meantime, the enclosed report serves to answer questions, concerns received to date and provide more detailed and accurate iuformation. Attached is the original document, unchanged. Attached to this memo are several items related to enrollments, both actual and projections, as well as school capacities. We also include data on the enrollment data for students on the basis of their residence. Additional enrollment data will be provided in summary for the Board of Education at the December meeting. The first attachment is a one-page overview summary of the past five years of enrollment history, the current year enrollment, and five years of projected enrollment by grade level. Overall, enrollment is generally flat for the district as a whole. However, the projections begin to show a slight increase starting in 2012-13 into 2014-15 at which time we will have increased enrollment to its highest level over the past ten years. By level, elementary and middle schools will continue to see increases in enrollment during the next five years whereas high schools will decline in enrollment. The second attachment shows the detailed K-12 enrollment history and projections for each school. Historical data go back to the 1989-90 school year. Projections are through 2014-15. Projection years are boldfaced. The precision of projections at a school level and for specific grade levels within a school are less accurate when compared to the district as a whole. Furthermore, projections are much less reliable for later years in the projection timeline. Also, the worksheet reflects various program and boundary changes that were implemented and this accounts for some large shifts within schools and programs from one year to the next. The third attachment contains two sheets – one for elementary and one for middle and high combined – and details the maximum capacities for each school, the current enrollment and capacity percentage, and the projected 2014-15 enrollment and capacity percentage. The sheets are organized by attendance area. Summaries are provided for levels. From the data, it appears elementary schools that have long term capacity constraints include Gompers,.Lake View, Sandburg, Allis/Nuestro Mundo, Kennedy, Orchard Ridge, and Van Hise. However, the schools that share a building with a middle school have access to other space. Among middle schools, Jefferson Middle School is the only school that may experience capacity concerns. None of the high schools are expected to have capacity issues for the foreseeable future. Budget/Financing, Curriculum, Elections, Governance/Board Decision Making, School Climate, What Can I Do? On Tuesday, he finished just ahead of Rose Fernandez, a former pediatric trauma nurse and parent advocate, in a five-person field. In addition to being first to declare his candidacy, Evers also captured endorsements – and contributions – from the Wisconsin Education Association Council as well as other labor and education-based groups. WEAC PAC, the political arm of the state’s largest teachers union, contributed $8,625 to Evers’ campaign, in addition to spending nearly $180,000 on media buys for the candidate, according to campaign filings earlier this month. By contrast, the Fernandez campaign spent $20,000. She said that her message of calling for merit pay for teachers and choices for parents had resonated with voters. Evers, 57, has distanced himself somewhat from the current schools superintendent, Elizabeth Burmaster, saying it’s time to be more aggressive about reforming Milwaukee Public Schools and calling for an increase in the state’s graduation rate. John Nichols on the history of the DPI Superintendent. uddenly, there’s another major state race brewing for early 2009. Supreme Court Chief Justice Shirley Abrahamson has been preparing for a challenge from conservatives in her bid for re-election, sparking speculation of a repeat of the past two partisan-ized races that saw conservatives take over the court majority. Emerging as a likely candidate is Jefferson County Circuit Judge Randy Koschnick. And now conservatives and liberals are expected to battle over the state school superintendent’s job following Department of Public Instruction chief Libby Burmaster’s surprise announcement she’ll pass on a re-election bid. Though the post is officially non-partisan, Burmaster has been seen as a big ally of Dem Gov. 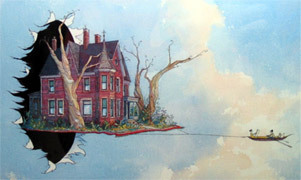 Jim Doyle. Doyle has strong ties to Madison West High School, where Burmaster worked as principal. Already, the potential list of competitors is up to three. Tony Evers, Burmaster’s deputy of the past seven-plus years, immediately e-mailed supporters announcing his intention to run for the post. Van Mobley, a history professor at Concordia University in Mequon and a member of the Thiensville Village Board, is mulling a run and will make his decision in November. And Rose Fernandez, president of president of the Wisconsin Coalition of Virtual School Families, has been considering a run for DPI superintendent, according to a state campaign veteran with ties to her. Evers, who ran unsuccessfully for the job in 2001, and Mobley gave interviews to WisPolitics this week about their visions for the job. Attempts to reach Fernandez were unsuccessful. You are quite new to the MMSD. I am EXTREMELY disappointed that you would “cave in” to MTI regarding a long-standing quarrel it has had with the MMSD without first taking the time to get input from ALL affected parties, i.e., students and their parents as well as teachers who might not agree with Matthews on this issue. Does this agreement deal only with online learning or ALL non-MMSD courses (e.g., correspondence ones done by mail; UW and MATC courses not taken via the YOP)? Given we have been waiting 7 years to resolve this issue, there was clearly no urgent need for you to do so this rapidly and so soon after coming on board. The reality is that it is an outright LIE that the deal you just struck with MTI is not a change from the practice that existed 7 years ago when MTI first demanded a change in unofficial policy. I have copies of student transcripts that can unequivocally PROVE that some MMSD students used to be able to receive high school credit for courses they took elsewhere even when the MMSD offered a comparable course. These courses include high school biology and history courses taken via UW-Extension, high school chemistry taken via Northwestern University’s Center for Talent Development, and mathematics, computer science, and history courses taken at UW-Madison outside of the YOP. One of these transcripts shows credit for a course taken as recently as fall, 2005; without this particular 1/2 course credit, this student would have been lacking a course in modern US history, a requirement for a high school diploma from the State of Wisconsin. The MMSD BOE was well aware that they had never written and approved a clear policy regarding this matter, leaving each school in the district deciding for themselves whether or not to approve for credit non-MMSD courses. They were well aware that Madison West HAD been giving many students credit in the past for non-MMSD courses. The fact is that the BOE voted in January, 2007 to “freeze” policy at whatever each school had been doing until such time as they approved an official policy. Rainwater then chose to ignore this official vote of the BOE, telling the guidance departments to stop giving students credit for such courses regardless of whether they had in the past. The fact is that the BOE was in the process of working to create a uniform policy regarding non-MMSD courses last spring. As an employee of the BOE, you should not have signed an agreement with MTI until AFTER the BOE had determined official MMSD policy on this topic. By doing so, you pre-empted the process. There exist dozens of students per year in the MMSD whose academic needs are not adequately met to the courses currently offered by MTI teachers, including through the District’s online offerings. These include students with a wide variety of disabilities, medical problems, and other types of special needs as well as academically gifted ones. By taking appropriate online and correspondence courses and non-MMSD courses they can physically access within Madison, these students can work at their own pace or in their own way or at an accessible location that enables them to succeed. “Success for all” must include these students as well. Your deal with MTI will result in dozens of students per year dropping out of school, failing to graduate, or transferring to other schools or school districts that are more willing to better meet their “special” individual needs. Your rush to resolve this issue sends a VERY bad message to many families in the MMSD. We were hoping you might be different from Rainwater. Unfortunately, it says to them that you don’t really care what they think. It says to them that the demands of Matthews take primarily over the needs of their children. Does the MMSD exist for Matthews or for the children of this District? As you yourself said, the MMSD is at a “tipping point”, with there currently being almost 50% “free and reduced lunch” students. Families were waiting and hoping that you might be different. As they learn that you are not based upon your actions, the exodus of middle class families from the MMSD’s public schools will only accelerate. It will be on your watch as superintendent that the MMSD irreversibly turns into yet another troubled inner city school district. I urge you to take the time to learn more about the MMSD, including getting input from all interested parties, before you act in the future. “Tuesday’s agreement also will implement a measure that requires a licensed teacher from the bargaining unit supervise virtual/online classes within the district. The district and union have bickered on-and-off for nearly seven years over the virtual/online education issue. Matthews said the district was violating the collective bargaining contract with development of its virtual school learning program that offered online courses taught by teachers who are not members of MTI. In the agreement announced Tuesday, there were no program changes made to the current virtual/online curriculum, but requirements outlined in the agreement assure that classes are supervised by district teachers. During the 2007-08 school year, there were 10 district students and 40 students from across the state who took MMSD online courses. Though Nerad has been on the job for less than three months, Matthews said he is pleased with his initial dealings and working relationship with the new superintendent. “This is that foundation we need,” Matthews said. “There was a lot of trust level that was built up here and a lot of learning of each other’s personalities, style and philosophy. All those things are important. In Madison, where schools Superintendent Art Rainwater in a 2004 memo described 4K as potentially “the next best tool” for raising students’ performance and narrowing the racial achievement gap, years of study and talks with leaders of early childhood education centers have failed to produce results. “It’s one of the things that I regret the most, that I think would have made a big impact, that I was not able to do,” said Rainwater, who is retiring next month after leading the district for a decade. “We’ve never been able to get around the money,” said Rainwater, whose tenure was marked by annual multimillion-dollar budget cuts to conform to the state’s limits on how much money districts can raise from local property taxpayers. A complicating factor was the opposition of Madison Teachers Inc., the teachers union, to the idea that the 4K program would include preschool teachers not employed by the School District. However, Rainwater said he’s “always believed that those things could have been resolved” if money had been available. Starting a 4K program for an estimated 1,700 students would cost Madison $5 million the first year and $2.5 million the second year before it would get full state funding in the third year under the state’s school-funding system. In comparison, the entire state grant available to defray Wisconsin districts’ startup costs next year is $3 million — and that amount is being shared by 32 eligible districts. One of those districts, Green Bay, is headed by Daniel Nerad, who has been hired to succeed Rainwater in Madison. “I am excited about it,” said Madison School Board President Arlene Silveira, who is envious of the 4K sign-up information that appears on the Green Bay district’s Web site. “He’s gone out and he’s made it work in Green Bay. That will certainly help us here as we start taking the message forward again. Madison’s inability to start 4K has gained the attention of national advocates of 4K programs, who hail Wisconsin’s approach as a model during the current national economic downturn. Milwaukee, the state’s largest district, long has offered 4K. “It’s been disappointing that Madison has been very slow to step up to provide for its children,” said Libby Doggett, executive director of Pre-K Now, a national nonprofit group in Washington, D.C., that campaigns for kindergarten programs for children ages 3 and 4. 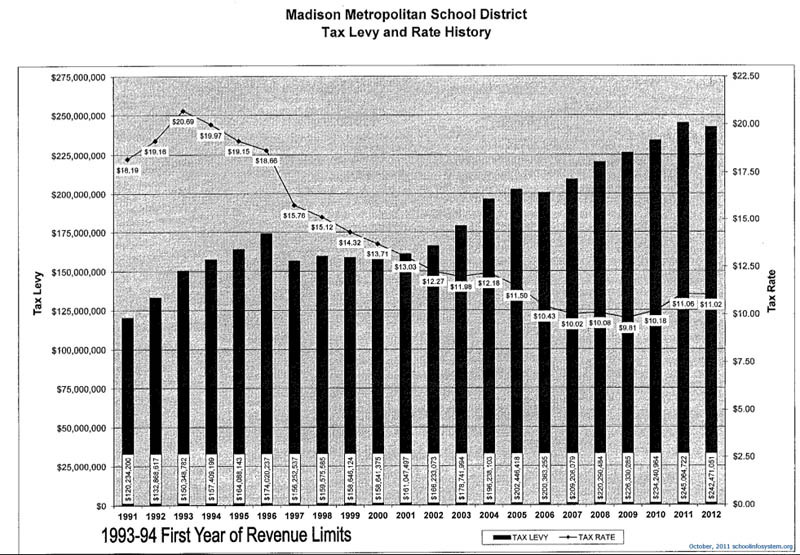 MMSD Budget History: Madison’s spending has grown about 50% from 1998 ($245,131,022) to 2008 ($367,806,712) while enrollment has declined slightly from 25,132 to 24,268 ($13,997/student). Craig Gerlach will be the next superintendent of the Monona Grove School District. Gerlach’s selection was announced Wednesday night at a School Board meeting in Cottage Grove. The father of two said he was attracted to Monona Grove because of its reputation. “I don’t have all the answers,” Gerlach admitted, but said he looked forward to moving the district ahead. “It’s exciting to be here,” he said. Three out of 10 of us either work in an educational institution or learn in one. Education eats up 8% of the Gross National Product. Keeping it all going is the biggest line item on city budgets. Whether the results are worth it sometimes makes teachers and parents–and administrators and politicians–raise their voices and point fingers. In the 1930s, the United States was fragmented into 130,000 school districts. After decades of consolidation, there are now fewer than 15,000. They range in size from hundreds that don’t actually operate schools–but bus children to other districts–to giants like the Los Angeles Unified District, with three-quarters of a million students. Greater Chicago has 332 public school districts and 589 private schools within its eight counties. Metropolitan Los Angeles takes in 35 public library systems. Greater Denver counts 15 public and private colleges and universities. Moving into any of America’s metro areas means stepping into a thicket of school districts, library systems, private school options and public and private college and universities. The Madison area has incredible resources for our children. The key of course, is leveraging that and being open to working effectively with many organizations, something Marc Eisen mentioned in his recent article. Madison’s new Superintendent has a tremendous opportunity to leverage the community from curricular, arts, sports, health/wellness, financial and volunteer perspectives. Madison School District small learning community Grant application(s) and history. My Life and Times with the Madison Public Schools. Update on Credit for Non-MMSD Courses. The Madison area, which includes all of Dane County as well as immediately adjoining areas, was awarded A+ for class size and spending per pupil in public schools, and for the popularity of the city’s public library. The greater Madison area scored an A for being close to a college town and for offering college options. Private school options in the greater Madison area were graded at B+. There has been some confusion in the response to the rankings because they lump together numerous school districts — urban, suburban and rural. The engineering-based program is just one example of the district’s willingness to bring college-level learning to his high school students. That effort appears to be paying off nationally, WISC-TV reported. “This is not a community that accepts anything but the best and so that bar is always high,” said Madison Metropolitan School District Superintendent Art Rainwater. Rainwater also credits the ranking to teacher development programs. “We spend an awful amount of time and an awful amount of effort working with our teachers in terms of how they deliver instruction to individual children,” said Rainwater. He said the school district will continue to improve techniques, focusing on the needs of every student. 2007/2008 Madison School District Budget Outlook: Half Empty or Half Full? The first attachment is a one-page overview summary of the past five years of enrollment history, the current year enrollment, and five years of projected enrollment by grade level. Overall, enrollment is generally flat for the district as a whole. However, enrollment has increased slightly for the past two (2) years. We project that this increase will continue for the next two years through 2012-13. After 2012-13 District overall enrollment K-12 will begin to decline slightly. Overall District enrollment has been remarkably stable since 1992 (minimum= 23,556 in 1992, maximum= 24,962 in 1998, average of 24,426 over the past 20 years. By level, we project that only middle schools will continue to see increases in enrollment during the next five years whereas high and elementary schools will decline in enrollment. Elementary enrollments five years out are based largely on births 5 years prior. Births were at historical highs from 2004 to 2007 (over 3100 births in the City of Madison in each of those years, the highest since the mid 1960’s). Births declined in 2008 (-8%) and 2009 (-13%) respectively from the 2007 high. The second attachment shows the detailed K-12 enrollment history and projections for each school. Actual enrollment is displayed for 2006 to 2011. Projections are through 2015-16. Projection years are boldfaced. The precision of projections at a school level and for specific grade levels within a school are less accurate when compared to the district as a whole. Furthermore, projections are much less reliable for later years in the projection timeline. Also, the worksheet reflects various program and boundary changes that were implemented and this accounts for some large shifts within schools and programs from one year to the next. Related: 11/2005: Where Have all The Students Gone, and Dane County Population Trends: 1990 –. Kansas City Superintendent John Covington this afternoon unveiled his sweeping plan to close half of the district’s schools, redistribute grade levels and sell the downtown central office. Covington presented his proposal to the school board in advance of a series of forums next week where the community will get to weigh in on what would be the largest swath of closures in district history, as well as a major reorganization. Covington wants to be able to complete the public debate and present a final plan for a vote by the board at its Feb. 24 meeting. The board and the community have a lot to digest over the next 10 days. •29 to 31 of the district’s 60 schools would close, including Westport High and Central Middle. The Kansas City experiment suggests that, indeed, educational problems can’t be solved by throwing money at them, that the structural problems of our current educational system are far more important than a lack of material resources, and that the focus on desegregation diverted attention from the real problem, low achievement. Former Madison School District Superintendent Art Rainwater served in Kansas City prior to his time in Madison. This is rather astonishing, given the amount of money spent in Kansas City. Here’s the latest exhibit on how polarized the country is and how much distrust exists of President Obama. He plans what seems like a simple speech to students around the country on Tuesday to encourage them to do well in school. But some Republicans are objecting to the back-to-school message, asserting that Obama wants to indoctrinate students. Wednesday, after the White House announced the speech, the Department of Education followed up with a letter to school principals and a lesson plan. The Department of Education has now changed their supplementary materials on President Obama’s upcoming address to schoolchildren on the importance of education — eliminating a phrase that some conservatives, such as the Florida GOP, happened to have been bashing as evidence of socialist indoctrination in our schools. om Horne, Arizona’s superintendent of public instruction, put out his own statement, with an education-oriented critique of the speech and its lesson plans. The White House materials call for a worshipful, rather than critical approach to this speech. For example, the White House communication calls for the students to have ‘notable quotes excerpted (and posted in large print on the board),’ and for the students to discuss ‘how will he inspire us,’ among other things. …In general, in keeping with good education practice, students should be taught to read and think critically about statements coming from politicians and historical figures. Just as it quickly became impossible to have a rationale discussion about health care as August wore on, we could be heading that way on education. If you haven’t heard (don’t get cable news? ), President Obama plans to give a speech to the nation’s schoolchildren next week. To accompany it the Department of Education prepared a – gasp – study guide with some ideas for how teachers can use the speech as a, dare I say it, teachable moment. Conservatives are screaming that this is unprecedented and amounts to indoctrination and a violation of the federal prohibition on involvement in local curricular decisions. Even the usually level-headed Rick Hess has run to the ramparts. We’re getting lectured on indoctrination by the same people who paid national commentators to covertly promote their agenda. Please. Enough. The only thing this episode shows is how thoroughly broken our politics are. Let’s take the two “issues” in turn. The speech, which will be broadcast live from Wakefield High School in Arlington County, was planned as an inspirational message “entirely about encouraging kids to work hard and stay in school,” said White House spokesman Tommy Vietor. Education Secretary Arne Duncan sent a letter to principals nationwide encouraging them to show it. But the announcement of the speech prompted a frenzied response from some conservatives, who called it an attempt to indoctrinate students, not motivate them. Although Eisenhower is commonly remembered for a farewell address that raised concerns about the “military-industrial complex,” his letter offers an equally important — and relevant — warning: to beware the danger posed by those seeking freedom from the “mental stress and burden” of democracy. Eisenhower could have discarded Biggs’s note or sent a canned response. But he didn’t. He composed a thoughtful reply. After enduring Senator Joseph McCarthy of Wisconsin, who had smeared his old colleague Gen. George C. Marshall as a Communist sympathizer, and having guarded the Republican Party against the newly emergent radical right John Birch Society, which labeled him and much of his cabinet Soviet agents, the president perhaps welcomed the opportunity to expound on his vision of the open society. Critical thinking is good for kids and good for society. I attended a recent Russ Feingold lunch [mp3 audio]. He spoke on a wide range of issues and commendably, took many open forum questions (unlike many elected officials), including mine “How will history view our exploding federalism?”. A fellow luncheon guest asked about Obama’s use of “Czar’s” (operating outside of Senate review and confirmation). Feingold rightly criticized this strategy, which undermines the Constitution. I would generally not pay much attention to this, but for a friends recent comment that his daughter’s elementary school (Madison School District) teacher assigned six Obama coloring projects last spring. President Obama’s plan to speak to America’s schoolchildren next Tuesday has some Republicans in an uproar. “As the father of four children, I am absolutely appalled that taxpayer dollars are being used to spread President Obama’s socialist ideology,” thunders Jim Greer, chairman of Florida’s Republican Party, in a press release. “President Obama has turned to American’s children to spread his liberal lies, indoctrinating American’s [sic] youngest children before they have a chance to decide for themselves.” Columnists who spy a conspiracy behind every Democrat are also spreading alarm. This is overwrought, to say the least. According to the Education Department’s Web site, Mr. Obama “will challenge students to work hard, set educational goals, and take responsibility for their learning”–hardly the stuff of the Communist Manifesto or even the Democratic Party platform. America’s children are not so vulnerable that we need to slap an NC-17 rating on Presidential speeches. Given how many minority children struggle in school, a pep talk from the first African-American President could even do some good. Rainwater came to the Madison Metropolitan School District in 1994 … “I’m very much data and research oriented,” he says, citing that as a major reason the Madison district hired him. Wisconsin needs a comprehensive assessment system that provides educators and parents with timely and relevant information that helps them make instructional decisions to improve student achievement,” said State Superintendent Elizabeth Burmaster in announcing members of a statewide Next Generation Assessment Task Force. Representatives from business, commerce, and education will make recommendations to the state superintendent on the components of an assessment system that are essential to increase student achievement. Task force members will review the history of assessment in Wisconsin and learn about the value, limitations, and costs of a range of assessment approaches. They will hear presentations on a number of other states’ assessment systems. Those systems may include ACT as part of a comprehensive assessment system, diagnostic or benchmark assessments given throughout the year, or other assessment instruments and test administration methods. The group’s first meeting will be held October 8 in Madison. 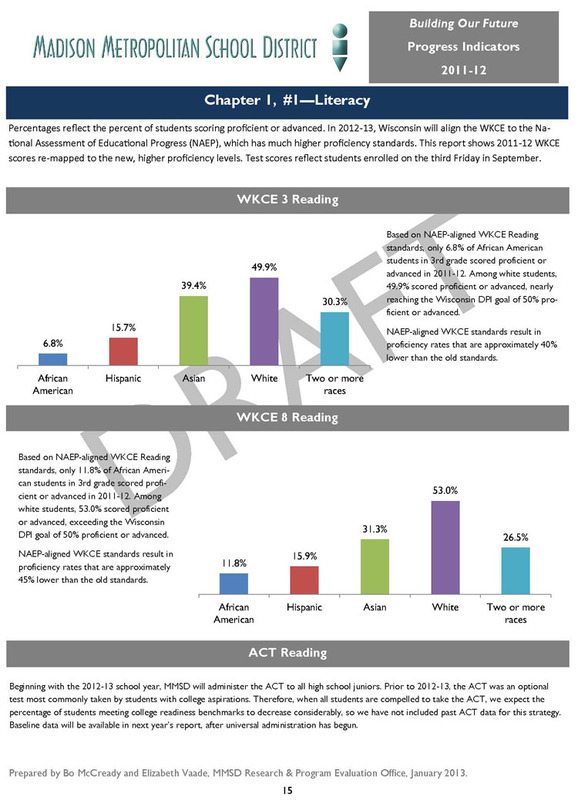 The Madison School District’s “Value Added Assessment System” uses WKCE results. Budget/Financing, Elections, Events, Governance/Board Decision Making, History - Madison Schools, School Climate, What Can I Do? In the first major test for newly hired Superintendent Daniel Nerad, Madison school officials this week will begin public discussions of whether to ask voters for additional money to head off a potentially “catastrophic” $8.2 million budget gap for the 2009-10 school year. The Madison School Board’s meetings in August will be dominated by talk of the possible referendum, which could appear on the Nov. 4 ballot. The public will be invited to speak out at forums on Aug. 12 and 14. Madison School District Budget history. The current 2008-2009 budget is $367,806,712, up from $339,685,844 in 2007-2008 (the 08/09 budget includes $17M for a new far west side school). The “final” budget numbers typically change a number of times throughout the year as new tax revenues appear (schools receive tax dollars via local property taxes, redistributed state income and sales taxes and some federal income taxes. Formulas, legislation and grants often change, including those based on enrollment). Tax & spending referendum climate. Props to the District for finding a reduced spending increase of $1,000,000 and looking for more (The same service budget growth, given teacher contract and other increases vs budget growth limits results in the “gap” referred to in Hall’s article above). Happily, Monday evening’s referendum discussion included a brief mention of revisiting the now many years old “same service” budget approach (28mb mp3, about 30 minutes). A question was also raised about attracting students (MMSD enrollment has been flat for years). Student growth means additional tax and spending authority for the school district. The Madison school board has been far more actively involved in financial issues recently. Matters such as the MMSD’s declining equity (and related structural deficit) have been publicly discussed. A very useful “citizen’s budget” document was created for the 2006-2007 ($333M) and 2007-2008 ($339M) (though the final 2007-2008 number was apparently $365M) budgets. Keeping track of changes year to year is not a small challenge. Curriculum, Curriculum - Languages, Governance/Board Decision Making, History - Madison Schools, School Climate, What Can I Do? West HS English 9 and 10: Show us the data!